Please note: We have tried to obtain permission for each testimonial used. However with so many coming in over the years it is hard to keep track. If we have used yours without permission and you would like it removed, please contact us and we will take care of it. Hi my name is Angel Rodriguez aka the “kiddo of the class”. 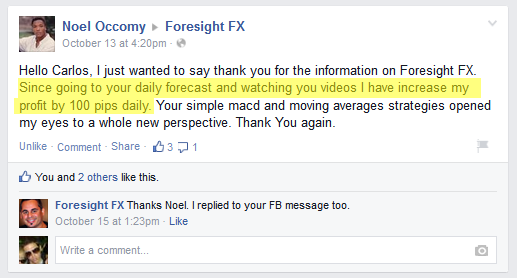 I’m very impressed with the OMEGAVUS FORECAST SYSTEM (now called Foresight FX), for me its a blessing!!! 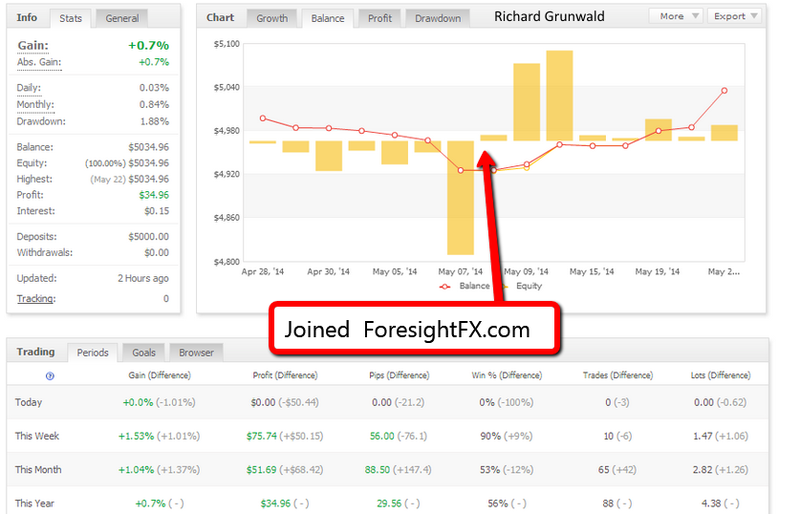 Its the most impressive way to build a money account on the FOREX market, for me have been great, I’ve open an account of 25k and I’ve build a return of 18% trading only 3 days a week for only one month!!!!!!!!! Ive been trading for 8 months on a demo account,after this week ive taken the plunge and am waiting on my live account being setup. 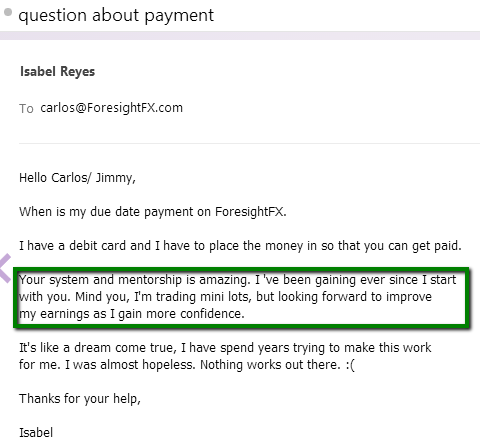 I’m so confident now with your guidance I can finally make some money and hope I can stay under your wing for the future. All came good for me today,in at the zone,out with half at target one,out at target 2 with the second half (well just above after the bounce) then used —- and —— to get me another 30 pips later as it headed for target 3. 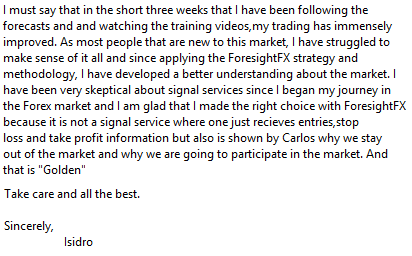 I am trading Live Forex using Signals from Carlos and found it very accurate. He is very knowledgeable and has good understanding of Entry and Exits points. I am very happy and will continue to use his signals. I highly recommend his services. I went short from beginning of the zone and made 130 pips and still going. Can see that you will be successful in this pursuit. Carlos, I am quite happy to have found your site because i know it will give me a new lease on life…i do not want to return to the rate race. Have a great weekend. Thanks for your sincerity, I appreciate the way you declare things. It tells me that you are REAL. Want to learn more from you and I confirm I want to be part of that lucky number. 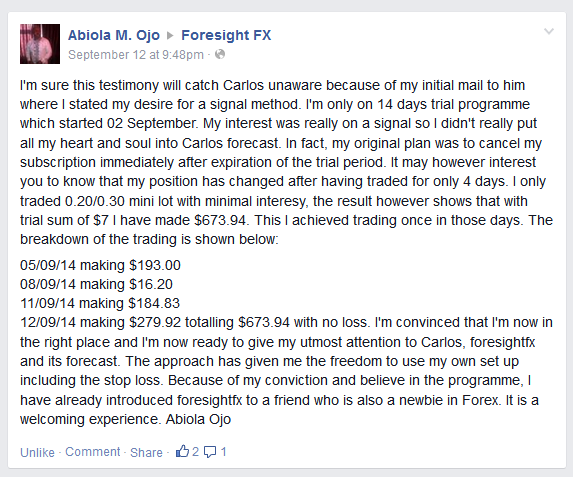 A week ago I had the great opportunity and chance to get to know foresightFX.com signals and the results are just incredible. In less than a week I could see the tremendous benefits of the system and signals as well as the substantial profits in pips that it generates. The system can predict before the market actually opens, the tendency and where the market will go and end up. All this thanks to a great, profitable and professional trader who is in the business for 17 years and gives you all the steps to follow to take the signals. 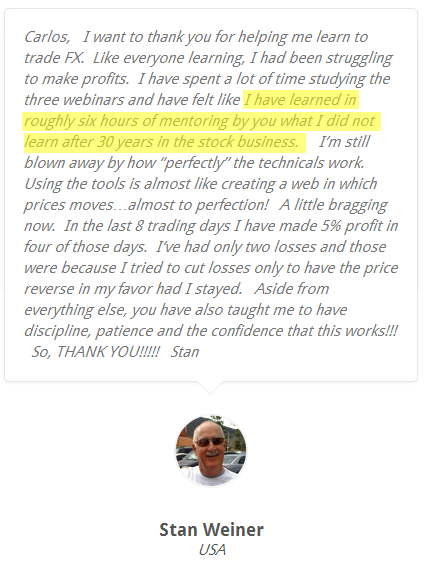 It is very easy and anyone with or without experience trading can do it. I am really amazed by the system and I see a great potential in it. 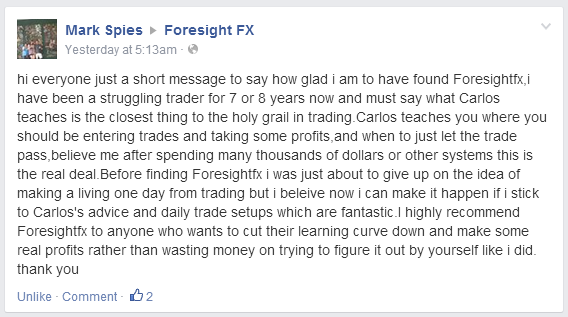 GREAT Call Carlos… I closed the trade at 110 pips… no need for greed. TP at 1.6021… As soon as I was in the trade there was nothing but green profit… I don’t think the Market Even moved against me… I could have set my SL 3pips away from my entry and never been stopped out. 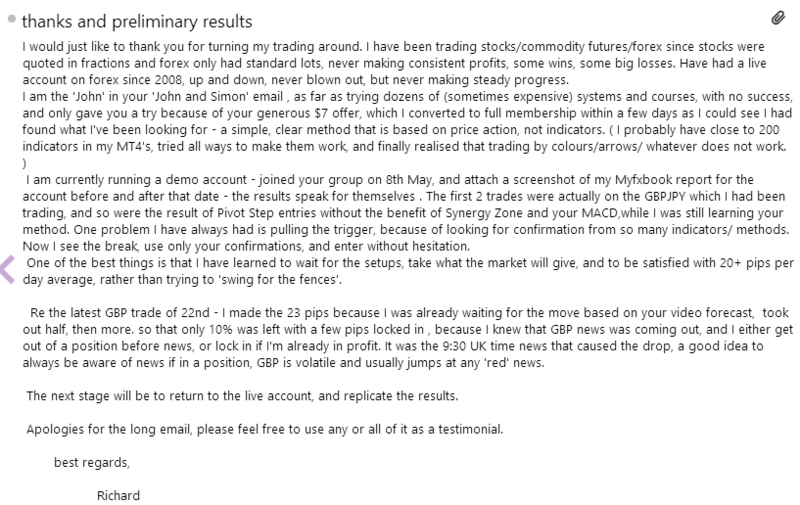 How cool is that:-) Long story short, I finally closed my position with 101 Pips profit. I’m not brave enough to trade 2 positions yet, since I’m trading a full lot as it is… there’s no need for greed! If I’m feeling that you’re not too confident with where the Markets going, I stand back and just watch and learn. 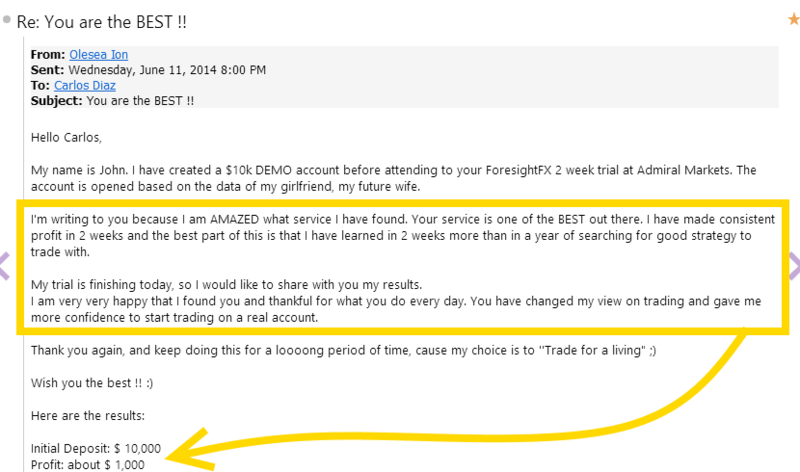 I love what you’re doing and there is no one that could buy me out of my Foresight membership. Maybe I’ll quit after we’ve hit that 7 figure bracket:-) But hey, why would I? 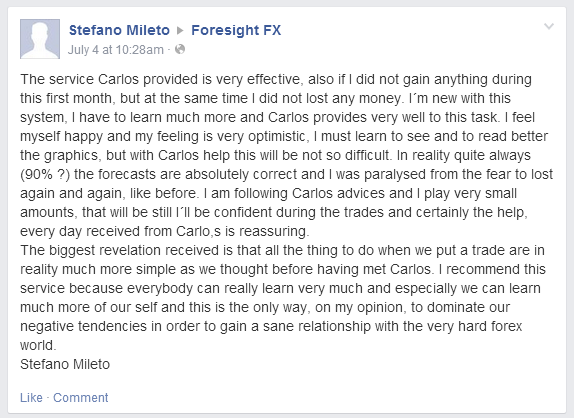 You’re worth every dime you’re charging for your forecasting service Carlos. For me, it’s a bargain and a “no brainer”! As my way of saying thanks, feel free to share this testimony with others. You’re a good honest Man 🙂 ! Nice to hook up with you! I absolutely promise that I don’t normally send long emails (honestly)! This is the first time I have emailed you. I chatted with you through text on Steve’s site the day you did your presentation for us all. I have joined up with you (which I’m sure you’ll have noticed and am really excited about next year’s prospects. 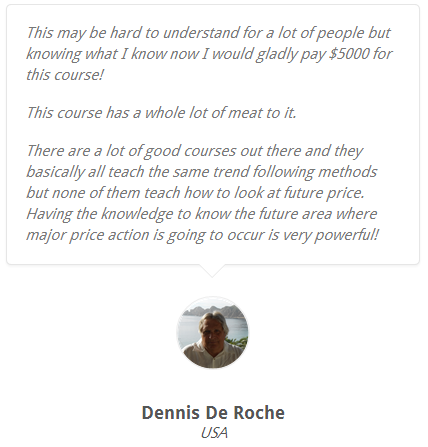 I am currently catching up with all your training and indicators from your site, which is nice and easy, very simple to follow your instructions and I really like the format in which you present the forecast and video review. I am new to trading and have basically followed Steve Nefdt from day one 4 months ago. He has been terrific and his money management advice has kept my account at break even to this point after many many trades. I understand that this will not provide me with the income I require but I’m happy to be at break even whilst learning. I stick to my methods without faltering and really hope to push forward next year with the edge that you and Steve will hopefully give. I have read your advice about making a living from trading and definitely consider myself capable of becoming a ‘professional trader’ as I have a good size account which won’t affect my family or I if I were to lose it and I will only risk up to 3.5% per trade as well as a call it a day maximum which is only slightly more than the 3.5% and I will follow instructions to the letter. From what I’ve seen so far you give me confidence in your ability. Thanks for going above and beyond the call of duty with the latest training videos; they’re very very useful and much appreciated! Keep up the excellent work…..when do you sleep?? I don’t even know how to start. Maybe with a BIG thank you! 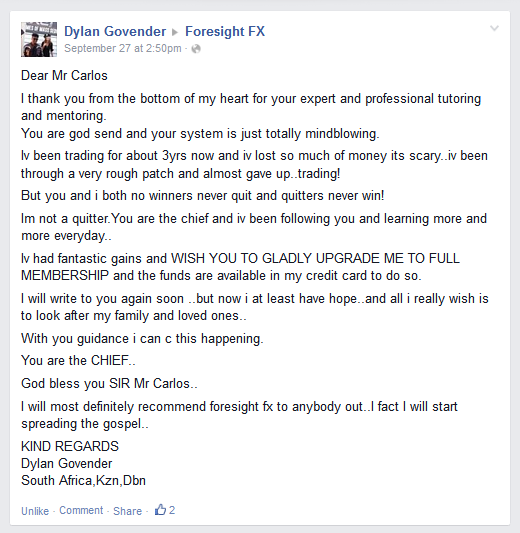 I am following you now for a month or so and you completely changed my way of trading in the good way (I can be profitable trading Forex). 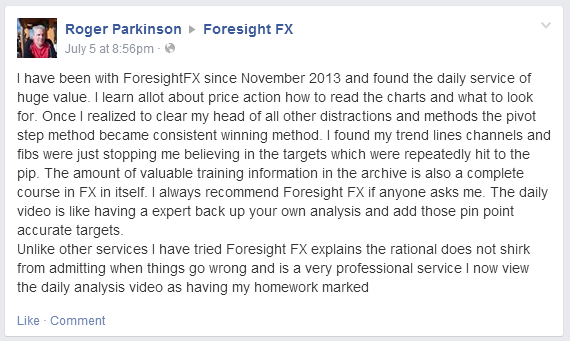 It’s amazing how easy and simple trading is with you and your methodology. Now I am not stressed anymore when taking a trade and I know exactly what to do and when to do (exits – SL PT). 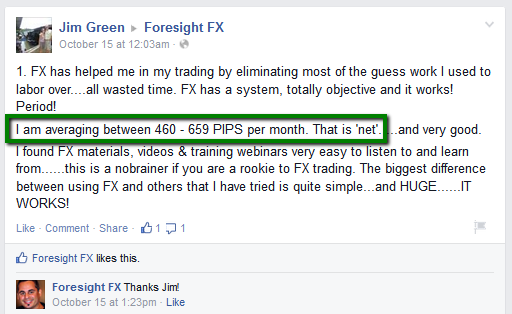 This is simply because of the great and simple method/system you have in place. All the words I could say in this email wouldn’t be enough to show you my gratitude. I will be following you and supporting you for long years to come! Thank you very much for your prompt reply. I’m very impressed by the level of attention and all your help. Again thank you very much for your help and care. Doug here. Here’s my screen shot showing my live chart at 2:13AM PST… 5:13AM your time where your Jan 21, 2010 forecast of 1.6157 target 2 has been hit. “GREAT CALL” Carlos… I sure hope you pip hunters out there are paying attention… that’s over 130 pips so far and I think that’s good enough for me… I’m going to bed.